mGinger is based in Bangalore, India and it is run by Ginger soft Media Pvt. Ltd. mGinger works on advertising basis ,they sent daily discounts of various products via messages to their customers. When the website was developed many started registering in it. Now it has more than 5 Million users in its community. This company is in India and it doesn't support for networks outside India. Yes, mGinger is 100% legit and pays their customers on time. You don't believe me then go to Google and search for mGinger reviews it has a very good feedback from its users. How much can we earn from mGinger? Well honestly speaking you can’t earn much from mGinger. 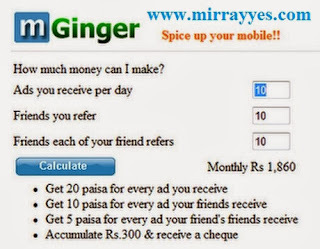 To earn more from mGinger then you have to refer your friends. More the referrals the more will be your income. So refer to as many members as possible to maximise your income. If you have a blog then put banners and try to gain more referrals. You will get Rs 2 for every valid referral by inviting friends to join your mGinger. You will get Rs 0.20 for every ad you will receive. You will get Rs 0.10 for every ad your friend receives. You will get Rs 0.05 for every ad your friend’s friend receives. So if you have 100 referrals then 100*0.10= Rs 10 daily which is sufficient to pay your mobile bill. You can’t earn huge amounts of money from mGinger. To earn a decent amount you should refer your friends. Making referrals is the secret to earn money from mGinger. You will not get ads daily, if you stay in metro cities like Hyderabad, Delhi, Bangalore, Mumbai then you can expect 1 or 2 ads daily. Hope that you liked the article on earning money by Receiving and Reading SMSs. For more ways to earn money online keep visiting.